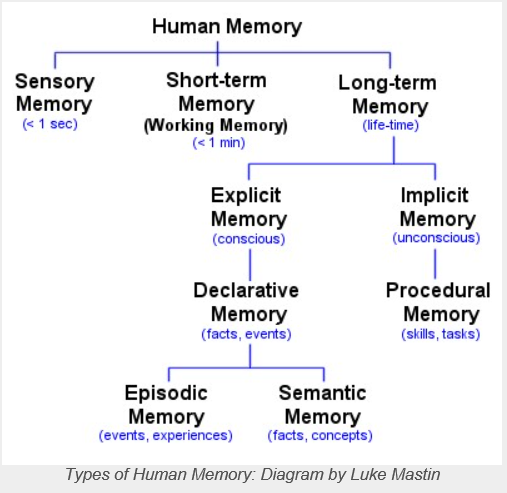 “Memory” is a single term that reflects a number of different abilities: holding information briefly while working with it (working memory), remembering episodes of one’s life (episodic memory), and our general knowledge of facts of the world (semantic memory), among other types. Remembering episodes involves three processes: encoding information (learning it, by perceiving it and relating it to past knowledge), storing it (maintaining it over time), and then retrieving it (accessing the information when needed). Failures can occur at any stage, leading to forgetting or to having false memories. The key to improving one’s memory is to improve processes of encoding and to use techniques that guarantee effective retrieval. Good encoding techniques include relating new information to what one already knows, forming mental images, and creating associations among information that needs to be remembered. The key to good retrieval is developing effective cues that will lead the rememberer back to the encoded information. Classic mnemonic systems, known since the time of the ancient Greeks and still used by some today, can greatly improve one’s memory abilities. YES, YOU CAN HAVE NO MEMORY IMPAIRMENT AND HAVE A DEMENTIA OR BRAIN DAMAGE! Memory is very important to understand as many a person has been told that their loved one has MCI or Mild Cognitive Impairment due tot he fact only 'recall' or one part of the whole memory companent has been assessed. In other words, if you can store the information in your brain and recall it accurately without delusions or errors, generally there is no Memory impairment. Now imagine if you cannot store any memories (complete amnesia) or you can store it but your recall is impaired. This leads to false memories and mistakes. It is common for people with acquired brain injury and other illnesses to have Short Term / Working Memory issues. Often this area is the go to point for Doctors often overlook Long Term Memory which is also important. Imagine if you cannot remember what a dog is (semantic facts) or a past event like your wedding day (life event). This is why the three areas above plus recall/retaining information must be answered. Article Below Extract:What Is Working Memory and How Is It Affected by Alzheimer's? 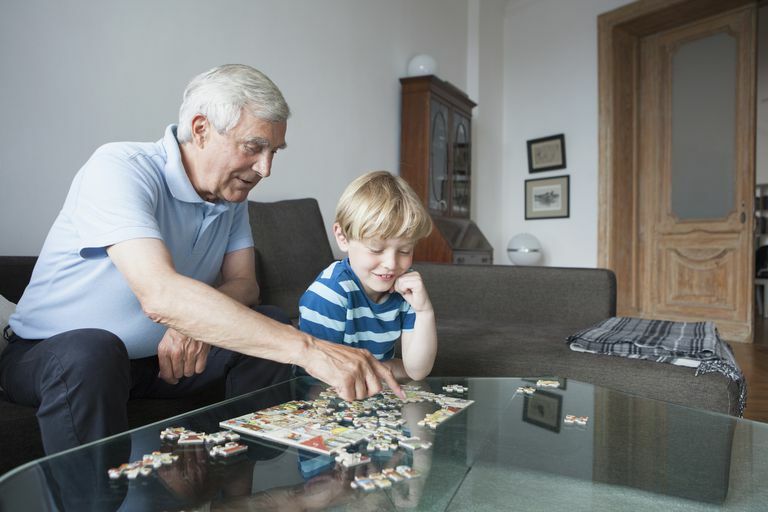 What Is Working Memory and How Is It Affected by Alzheimer's? Sometimes referred to as intermediate memory, the working memory may be thought of as a temporary storage bin for information that is needed to complete a specific task. Some researchers feel that working memory significantly overlaps with short-term memory, and might even argue that they're the same thing. However, the term working memory in research generally seems to imply the ability not only to remember information for a period of time but also to use, manipulate and apply it, perhaps while also accessing other stored pieces of information. According to Smith and Kosslyn in Cognitive Psychology, working memory is like a blackboard where you put information, move it around and use it, and then erase it and go on to the next task. An example of using working memory as described by Smith and Kosslyn is where you are participating in a discussion and you think of a comment you want to make. You have to wait until there's a pause in the conversation so that you won't interrupt someone else. You also need to listen to the debate so that you can adequately respond to the comments the other persons are making, all while not forgetting how you're going to present your own point. A third part, the central executive, is the controller and mediator of these two different aspects of our working memory. According to Baddeley and Hitch, the central executive processes information, directs attention, sets goals and makes decisions. How Do Alzheimer's and Other Kinds of Dementia Affect Working Memory? A study conducted by Kensinger, et al. researched working memory and how it is affected by Alzheimer's. They concluded that working memory is reduced in Alzheimer's, and that one of the reasons for this decline is the effect of Alzheimer's on semantic memory. Semantic memory is the ability to understand and recognize words. Since language processing may be slower in Alzheimer's, working memory (which uses our stored memories) may also be impaired. Another study conducted by Gagnon and Belleville measured working memory by assessing participants' ability to retain numbers. They found that working memory is reduced in people with mild cognitive impairment in comparison to those with normal cognitive functioning, and further reduced in people who have Alzheimer's disease. Can You Improve Your Working Memory if You Have Alzheimer's Disease? Possibly. A research study by Huntley, Bor, Hampshire, Owen, and Howard demonstrated that people with early stage (mild) Alzheimer's were able to learn, use and benefit from chunking- a method where a person groups (chunks) material together to make it easier to remember. Some people also experience a temporary improvement in their memory through use of medications to treat Alzheimer's disease. Alzheimer's disease is the most common neurological disease of adult life. It afflicts 4 million people in the United States, and it's incidences increase with age. The early symptoms are characterized by an insidious onset and gradual progression of memory loss. 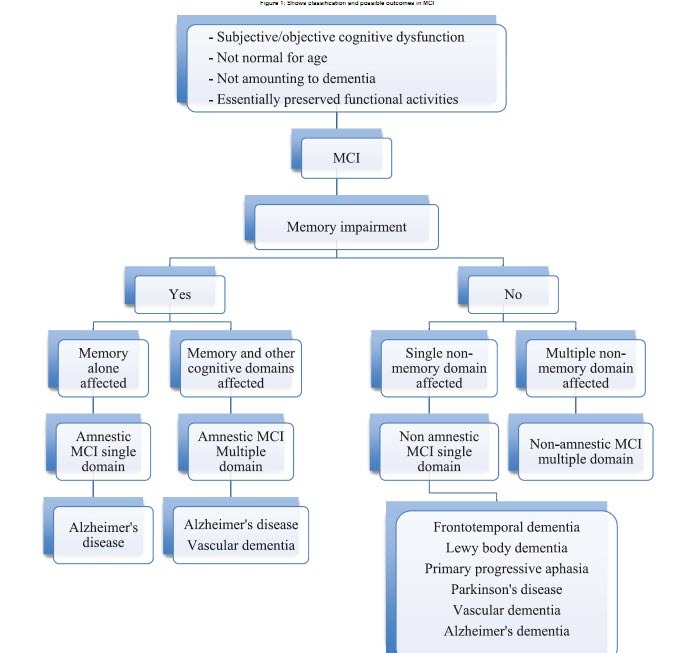 Some dementias, however, do not follow this pattern. Vascular dementias have recently been characterized by specific diagnostic criteria. They can be summarized by sudden onset of dementia and step-wise progression with focal neurological findings and positive brain imaging. Lewy body dementia is characterized by early appearance of symptoms in the course of dementia, accompanied by progression and hallucinations. Primary progressive aphasia includes early dissolution of speech in an otherwise cognitively intact individual. They can become globally aphasic in spite of being able to continue to run a household or even work. Eventually 20% per year progress to dementia, which appears similar in the advanced states to Alzheimer's disease. Frontal lobe dementias are characterized by early psychiatric symptoms followed later by cognitive impairments. Frontal lobe syndrome is therefore the presenting symptomatology: apathy, poor social judgment, and bizarre behavior. Histologically, the frontal lobe dementias are proven to be characterized by Pick's cells (Pick's disease). At the present time, these diverse histological types are clinically indistinguishable. When degenerative neurological diseases affect the subcortical structures, it may cause apathy and slowness of thinking which can be mistaken for dementia. Examples of such conditions are Parkinson's disease, olivo-ponto cerebellar atrophy (OPCA), and hydrocephalus. The following cases will illustrate a patient with frontal lobe dementia and OPCA as examples of uncommon dementias. A 74-year-old white woman was noted to have undergone a drastic personality change over the last year. She was described as becoming much quieter with several instances of paranoia and suspiciousness. The onset of these changes was described as slow with a gradual progression. She was preoccupied with her own safety. She always locked the house, even when her husband went to mow the lawn. She has been known to prop the back door closed with a shovel. When driving in the evening, she would disguise herself as a man, putting her hair up in a black knit cap. The patient's daughter removed a handgun from the home. Within one week the patient purchased another one. She looks for the gun every morning to make sure she knows where it is. At the present time the patient has hidden the gun and the bullets. She has accused her husband of having an affair. The patient, who was quite neat in the past, has become disheveled, not paying attention to her dressing and hygiene. Her ability to cook and clean the house has significantly deteriorated. In particular, she has developed hiding and hoarding behaviors. She was resistant to throwing anything away, including spoiled food. She tended to "over shop" and pack the freezer and refrigerator with food. Recently, she had become obsessed with winning the sweepstakes, and has ordered many books in order to enhance her chance of winning. The husband denied his wife has significant memory problems. There is no noted difficulty with memory loss or ability to recognize people or objects. She has shown no difficulty with driving a car, getting lost, or using household appliances and the telephone. The patient has a masters degree in education and has maintained her interests and hobbies, which include learning a foreign language. The neurological examination was normal. There was no evidence of dyspraxia or dysnomia during the evaluation. Visual spatial skills appeared to be intact. The Mini Mental State Examination score was 29/30. There was no depression and mood and affect were congruent. Some difficulty was present with abstract thinking. Neuropsychological testing showed intact remote memory, fluent speech, and non-labile affect. The patient was oriented to time, place, and person. The performance on tests of memory was in the average range. Her constructional and organizational skills were normal. The patient's response to a self-reported depression inventory were also within normal limits. However, on the test of verbal abstraction and reasoning, the patient performed in the low average range. Her ability to generate words was poor, also in the low average range. There was evidence of perseveration. Similarly, there was impairment on tasks which required shifting strategies. Concept formation and mental flexibility was moderately impaired. In summary, the neuropsychological testing was consistent with normal range for attention, visual spatial processing, and naming. In contrast, the patient had difficulty with executive functioning tasks such as verbal fluency, verbal abstraction, concept formation, and mental flexibility suggesting a predominantly largely frontal lobe dysfunction. MRI showed a soft tissue lesion in the fourth ventricle (Fig. 1). This was consistent with a probable subependymoma which was thought to be an incidental finding. There was evidence of frontal lobe atrophy (Fig. 2). The findings are suggestive of a degenerative disease of the frontal lobes. The presence of impaired judgment and executive skills with normal visual spatial and mnemonic function seem to suggest this condition. These "frontal lobe" dementias histologically have been proven to be consistent with Pick's disease, subcortical gliosis, or simple neuronal loss. The history of normal cognitive performance in the face of poor judgment, poor executive function, and the imaging consistent with frontal lobe involvement are the basis of this diagnosis. In the later stages as the dementia progresses involving posterior cerebral functions, it resembles Alzheimer's disease. Management is more challenging in the early stages than in Alzheimer's disease due to poor judgment and safety risks these patients represent. Because of this, they tend to be institutionalized earlier than patients with Alzheimer's disease. What we usually think of as “memory” in day-to-day usage is actually long-term memory, but there are also important short-term and sensory memory processes, which must be worked through before a long-term memory can be established. The different types of memory each have their own particular mode of operation, but they all cooperate in the process of memorization, and can be seen as three necessary steps in forming a lasting memory. This model of memory as a sequence of three stages, from sensory to short-term to long-term memory, rather than as a unitary process, is known as the modal or multi-store or Atkinson-Shiffrin model, after Richard Atkinson and Richard Shiffrin who developed it in 1968, and it remains the most popular model for studying memory. It is often also described as the process of memory, but I have used this description for the processes of encoding, consolidation, storage and recall in the separate Memory Processes section. It should be noted that an alternative model, known as the levels-of-processing model was proposed by Fergus Craik and Robert Lockhart in 1972, and posits that memory recall, and the extent to which something is memorized, is a function of the depth of mental processing, on a continuous scale from shallow (perceptual) to deep (semantic). 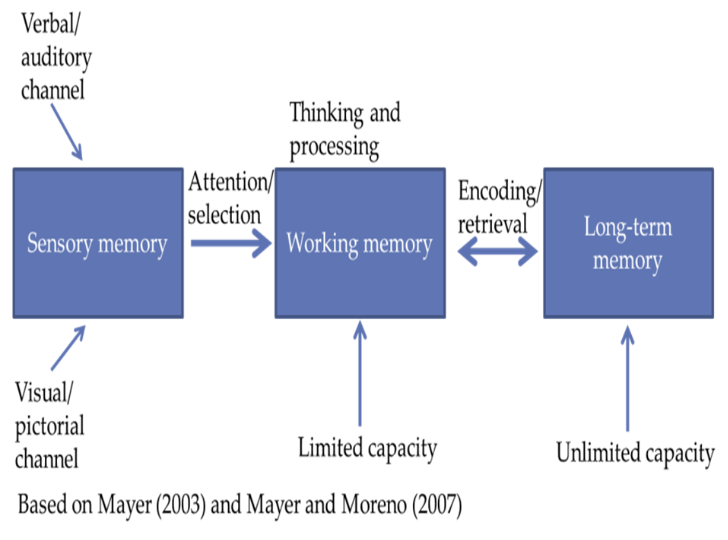 Under this model, there is no real structure to memory and no distinction between short-term and long-term memory. Sensory memory is the shortest-term element of memory. It is the ability to retain impressions of sensory information after the original stimuli have ended. It acts as a kind of buffer for stimuli received through the five senses of sight, hearing, smell, taste and touch, which are retained accurately, but very briefly. For example, the ability to look at something and remember what it looked like with just a second of observation is an example of sensory memory. The stimuli detected by our senses can be either deliberately ignored, in which case they disappear almost instantaneously, or perceived, in which case they enter our sensory memory. This does not require any conscious attention and, indeed, is usually considered to be totally outside of conscious control. The brain is designed to only process information that will be useful at a later date, and to allow the rest to pass by unnoted. As information is perceived, it is therefore stored in sensory memory automatically and unbidden. Unlike other types of memory, the sensory memory cannot be prolonged via rehearsal. Sensory memory is an ultra-short-term memory and decays or degrades very quickly, typically in the region of 200 - 500 milliseconds (1/5 - 1/2 second) after the perception of an item, and certainly less than a second (although echoic memory is now thought to last a little longer, up to perhaps three or four seconds). Indeed, it lasts for such a short time that it is often considered part of the process of perception, but it nevertheless represents an essential step for storing information in short-term memory. The sensory memory for visual stimuli is sometimes known as the iconic memory, the memory for aural stimuli is known as the echoic memory, and that for touch as the haptic memory. Smell may actally be even more closely linked to memory than the other senses, possibly because the olfactory bulb and olfactory cortex (where smell sensations are processed) are physically very close - separated by just 2 or 3 synapses - to the hippocampus and amygdala (which are involved in memory processes). Thus, smells may be more quickly and more strongly associated with memories and their associated emotions than the other senses, and memories of a smell may persist for longer, even without constant re-consolidation. Experiments by George Sperling in the early 1960s involving the flashing of a grid of letters for a very short period of time (50 milliseconds) suggest that the upper limit of sensory memory (as distinct from short-term memory) is approximately 12 items, although participants often reported that they seemed to "see" more than they could actually report. Short-term memories can become long-term memory through the process of consolidation, involving rehearsal and meaningful association. Unlike short-term memory (which relies mostly on an acoustic, and to a lesser extent a visual, code for storing information), long-term memory encodes information for storage semantically (i.e. based on meaning and association). However, there is also some evidence that long-term memory does also encode to some extent by sound. For example, when we cannot quite remember a word but it is “on the tip of the tongue”, this is usually based on the sound of a word, not its meaning. Physiologically, the establishment of long-term memory involves a process of physical changes in the structure of neurons (or nerve cells) in the brain, a process known as long-term potentiation, although there is still much that is not completely understood about the process. At its simplest, whenever something is learned, circuits of neurons in the brain, known as neural networks, are created, altered or strengthened. These neural circuits are composed of a number of neurons that communicate with one another through special junctions called synapses. Through a process involving the creation of new proteins within the body of neurons, and the electrochemical transfer of neurotransmitters across synapse gaps to receptors, the communicative strength of certain circuits of neurons in the brain is reinforced. With repeated use, the efficiency of these synapse connections increases, facilitating the passage of nerve impulses along particular neural circuits, which may involve many connections to the visual cortex, the auditory cortex, the associative regions of the cortex, etc. This process differs both structurally and functionally from the creation of working or short-term memory. Although the short-term memory is supported by transient patterns of neuronal communication in the regions of the frontal, prefrontal and parietal lobes of the brain, long-term memories are maintained by more stable and permanent changes in neural connections widely spread throughout the brain. The hippocampus area of the brain essentially acts as a kind of temporary transit point for long-term memories, and is not itself used to store information. However, it is essential to the consolidation of information from short-term to long-term memory, and is thought to be involved in changing neural connections for a period of three months or more after the initial learning. Unlike with short-term memory, forgetting occurs in long-term memory when the formerly strengthened synaptic connections among the neurons in a neural network become weakened, or when the activation of a new network is superimposed over an older one, thus causing interference in the older memory. Over the years, several different types of long-term memory have been distinguished, including explicit and implicit memory, declarative and procedural memory (with a further sub-division of declarative memory into episodic and semantic memory) and retrospective and prospective memory. Long-term memory is often divided into two further main types: explicit (or declarative) memory and implicit (or procedural) memory. Declarative memory (“knowing what”) is memory of facts and events, and refers to those memories that can be consciously recalled (or "declared"). It is sometimes called explicit memory, since it consists of information that is explicitly stored and retrieved, although it is more properly a subset of explicit memory. Declarative memory can be further sub-divided into episodic memory and semantic memory. Procedural memory (“knowing how”) is the unconscious memory of skills and how to do things, particularly the use of objects or movements of the body, such as tying a shoelace, playing a guitar or riding a bike. These memories are typically acquired through repetition and practice, and are composed of automatic sensorimotor behaviours that are so deeply embedded that we are no longer aware of them. Once learned, these "body memories" allow us to carry out ordinary motor actions more or less automatically. Procedural memory is sometimes referred to as implicit memory, because previous experiences aid in the performance of a task without explicit and conscious awareness of these previous experiences, although it is more properly a subset of implicit memory. These different types of long-term memory are stored in different regions of the brain and undergo quite different processes. Declarative memories are encoded by the hippocampus, entorhinal cortex and perirhinal cortex (all within the medial temporal lobe of the brain), but are consolidated and stored in the temporal cortex and elsewhere. Procedural memories, on the other hand, do not appear to involve the hippocampus at all, and are encoded and stored by the cerebellum, putamen, caudate nucleus and the motor cortex, all of which are involved in motor control. Learned skills such as riding a bike are stored in the putamen; instinctive actions such as grooming are stored in the caudate nucleus; and the cerebellum is involved with timing and coordination of body skills. Thus, without the medial temporal lobe (the structure that includes the hippocampus), a person is still able to form new procedural memories (such as playing the piano, for example), but cannot remember the events during which they happened or were learned. Declarative memory can be further sub-divided into episodic memory and semantic memory. Episodic memory represents our memory of experiences and specific events in time in a serial form, from which we can reconstruct the actual events that took place at any given point in our lives. It is the memory of autobiographical events (times, places, associated emotions and other contextual knowledge) that can be explicitly stated. Individuals tend to see themselves as actors in these events, and the emotional charge and the entire context surrounding an event is usually part of the memory, not just the bare facts of the event itself. Semantic memory, on the other hand, is a more structured record of facts, meanings, concepts and knowledge about the external world that we have acquired. It refers to general factual knowledge, shared with others and independent of personal experience and of the spatial/temporal context in which it was acquired. Semantic memories may once have had a personal context, but now stand alone as simple knowledge. It therefore includes such things as types of food, capital cities, social customs, functions of objects, vocabulary, understanding of mathematics, etc. Much of semantic memory is abstract and relational and is associated with the meaning of verbal symbols. support and underpin semantic memory. A gradual transition from episodic to semantic memory can take place, in which episodic memory reduces its sensitivity and association to particular events, so that the information can be generalized as semantic memory. Both episodic memory and semantic memory require a similar encoding process. However, semantic memory mainly activates the frontal and temporal cortexes, whereas episodic memory activity is concentrated in the hippocampus, at least initially. Once processed in the hippocampus, episodic memories are then consolidated and stored in the neocortex. The memories of the different elements of a particular event are distributed in the various visual, olfactory and auditory areas of the brain, but they are all connected together by the hippocampus to form an episode, rather than remaining a collection of separate memories. For example, memories of people’s faces, the taste of the wine, the music that was playing, etc, might all be part of the memory of a particular dinner with friends. By repeatedly reactivating or “playing back” this particular activity pattern in the various regions of the cortex, they become so strongly linked with one another that they no longer need the hippocampus to act as their link, and the memory of the music that was playing that night, for example, can act as an index entry, and may be enough to bring back the entire scene of the dinner party. Our spatial memory in particular appears to be much more confined to the hippocampus, particularly the right hippocampus, which seems to be able to create a mental map of space, thanks to certain cells called "place cells". Episodic memory does also trigger activity in the temporal lobe, but mainly in order to ensure that these personal memories are not mistaken for real life. This difference in the neurological processing of episodic and semantic memory is illustrated by cases of anterograde amnesia cases (a good example being a case known as “C.L.”) in which episodic memory is almost completely lost while semantic memory is retained. A further category of declarative memory, referred to as autobiographical memory, is sometimes distinguished, although really it is just one area of episodic memory. Autobiographical memory refers to a memory system consisting of episodes recollected from an individual’s own life, often based on a combination of episodic memory (personal experiences and specific objects, people and events experienced at particular times and places) and semantic memory (general knowledge and facts about the world). One specific type of autobiographical memory is known as a "flashbulb memory", a highly detailed, exceptionally vivid “snapshot” of a moment or circumstances in which surprising and consequential (or emotionally arousing) news was heard, famous examples being the assassination of John Kennedy, the terrorist bombings on 9/11, etc. Such memories are believed by some to be highly resistant to forgetting, possibly due to the strong emotions that are typically associated with them. However, a number of studies also suggest that flashbulb memories are actually not especially accurate, despite apparently being experienced with great vividness and confidence. An important alternative classification of long-term memory used by some researchers is based on the temporal direction of the memories. Retrospective memory is where the content to be remembered (people, words, events, etc) is in the past, i.e. the recollection of past episodes. It includes semantic, episodic and autobiographical memory, and declarative memory in general, although it can be either explicit or implicit. Prospective memory is where the content is to be remembered in the future, and may be defined as “remembering to remember” or remembering to perform an intended action. It may be either event-based or time-based, often triggered by a cue, such as going to the doctor (action) at 4pm (cue), or remembering to post a letter (action) after seeing a mailbox (cue). Clearly, though, retrospective and prospective memory are not entirely independent entities, and certain aspects of retrospective memory are usually required for prospective memory. Thus, there have been case studies where an impaired retrospective memory has caused a definite impact on prospective memory. However, there have also been studies where patients with an impaired prospective memory had an intact retrospective memory, suggesting that to some extent the two types of memory involve separate processes.